Film Conquerors of the Sun (2012) is the story of an agitprop train, Moscow to Berlin. It was screened on the 8th July at The Aubin Cinema in London, in conjunction with Kate MacGarry‘s show: Report from the Exhibition, which included works by artists Eustachy Kossakowski (1925 – 2001) and Goshka Macuga and their response to the work of Constructivist Kazimir Malevich. They’d never quite manage to lift such a load. In Tsarist times, religious information was dispatched to the countryside by trains but it was the Bolsheviks who developed their propaganda potential far more effectively. 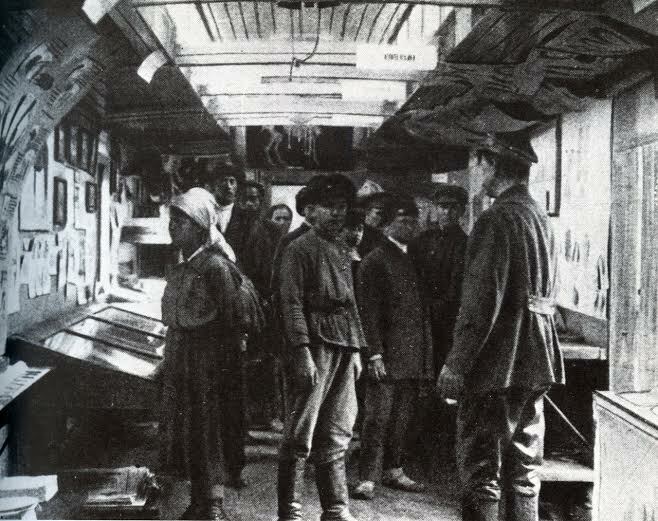 The first agitprop train was named after Lenin left from Moscow to Kazan in August 1918. The most famous one was the Red Star (Krasnaia Zvezda) which sailed with Lenin’s wife Nadezhda Krupskaya on board along the Volga and Kama rivers in 1919-1921. Each agitprop train was equipped with a small library and printing press for printing pamphlets and newspapers and a radio transmitter/ receiver to receive fresh information from Moscow. The Constructivists like Kazimir Malevich, Vladimir Mayakovsky or El Lissitzky were involved in creating artistic content and propaganda materials for the trains although the crucial artistic medium was film. The Soviets considered film the most ‘modern’ and ‘objective’ art form and the least encumbered with bourgeoisie associations. ‘Of all the arts, for us the cinema is the most important.’ (Lenin, 1919). Over 2 million people attended the cinema screenings (agitki) shown on board the agitprop trains. 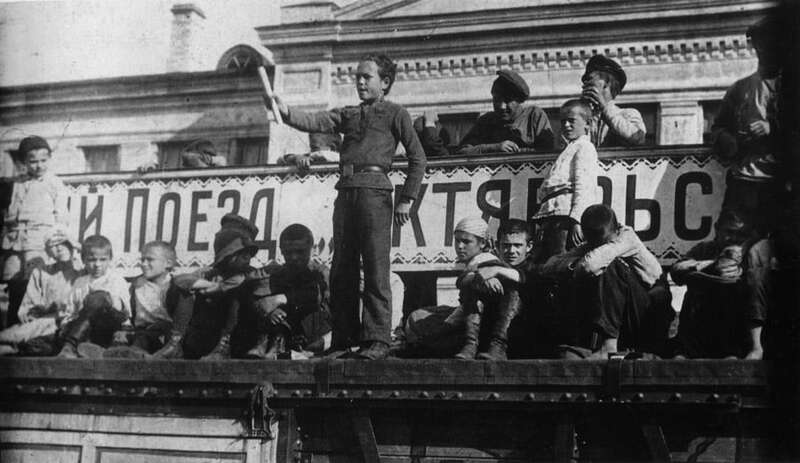 The great October Revolution in 1917 brought about a new system. Bolsheviks took over power. The Constructivists were in. New art aimed at social purpose, aesthetic values were out. This new artistic approach was the inspiration for Modernism but also happened to be a very powerful propaganda tool. Conquerors Of The Sun refers to this revolutionary ideas propagated by agitprop trains. Anna Baumgart compares its impact with the transforming power of the internet. In Polish art the idea of reaching new audiences using trains arose in subsequent artistic projects but in a different context. Cosmic Underground (2012) was a multidisciplinary train that travelled from Estonia to Portugal. It was a project created by a physicist Jan Świerkowski, the founder of the Institute B61, a performance group of artists and scientists. Travel Action (1976) (Akcja podróż) was the initiative of another group of artists, Andrzej Maziec, Bogdan and Witold Chmielewski, Stanisław Wasilewski and Wiesław Smużny which aimed to link people and nature, where the meeting of life and art happens. Authors of this project formed the Action Group (Grupa Działanie). Their work was referenced in the show Lucim is Alive in 2009 at the Centre of Contemporary Art Znaki Czasu in Torun. Both projects, Cosmic Underground and Travel Action represent different approaches. Together with Anna Baumgart’s film, they reignite a certain spirit of longing for the utopian idea which was supposed to change lives for the better forever. The past reappears in various incarnations: personal (private), ethnic, historic and social. Polish Past presented through historic events such as the annexation which started in 1795 and lasted for over 123 years, then the Communist take-over followed by the Second World War. All these events had a lasting effect on subsequent generations and their way of perceiving reality. After 1989 and the end of Communism in Poland, a new Critical Artist emerged, born of the frustrations of the time under Communism and reached maturity at the beginning of the new millennium. The rebelliousness of youth turned into a sensibility. The Critical Artist became an antiquarian submerged in the ethnical and sociological aspects of history. The Critical Artist became transformed into a Historiography Artist. Baumgart is a historiography artist who takes up the challenge and detects new contexts in the past. She evokes events from the past to subsidise a new thread in the artistic discourse. Her approach, as in Conquerors of the Sun, combines sober judgement with a certain sentimentality and idealisation of the past. The other influence in her work is the concept of the Past. She refers to it by giving subjective comments on historic events. In her work The Hypothesis of the Stolen Image (2008) she brings characters from the photograph of the Berlin Wall taken on the 13th August 1961 back to life by capturing the moment of crossing over the newly erected wall by the residents of the East Berlin with group sculptures. In The Ellipsis (2010), a joint project with Agnieszka Kurant, she reframes a moment in Polish history. 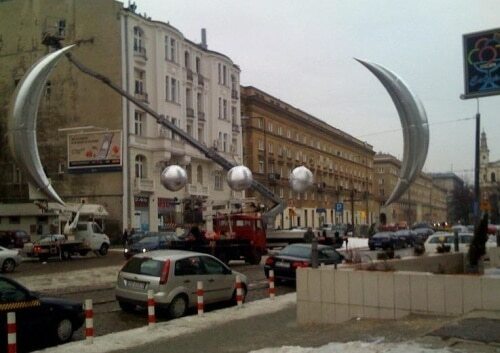 The movable sculpture of the resized ellipsis represents a gap in narration which refers to the Second World War and the footbridge at Chlodna Street in Warsaw, which connected two parts of the Jewish ghetto. But what would happen if men fabricated facts? John H Arnold in History: a Very Short Introduction claims that Marx was one of the most influential historiographers of our times. He wanted to interpret history by using a social and economical background to learn why nations undergo long term changes. In Conquerors Of The Sun, Baumgart reveals her urge to retell the story of agitprop trains and her fascination with the Revolutionary Socialist ideas which were reflected through the works of Constructivists like Malevich, Mayakovsky or Lissitzky. Their Polish followers, “a.r.” Group (The Revolutionary Artists or real Avant Garde) consisted of Katarzyna Kobro, Władysław Strzemiński, Julian Przyboś and Henryk Stażewski who founded the International Collection of Modern Art in Lodź. It’s no coincident that the mythical agitprop train from Baumgart’s film ends its journey in Kulszki near Łódź. We don’t know if this agitprop train even existed but Baumagrt’s reinterpretation of this part of Russian history implies that it did. This is more of an imagined fiction than meticulous antiquarian research. She suggests that the inspiration for the chidren’s poem, The Locomotive, by Julian Tuwim might indeed be the agitprop train which stopped in Poland on its way to Berlin. Perhaps it is possible. Then again, maybe not? Prof Andrzej Turowski is an art historian who specialises in Polish and Russian Constructivism. He plays the role of detective searching for the historical truth in Baumgart’s film, introducing us to the facts on the story of this agitprop train, which who knows, might just be a fabrication. But learning the truth is not the aim here. This speculation leads us to the utopian ideas which are fuelled by Baumgart’s nostalgia. In her film she recalls both a private and ethnical past. She compares a fleeting Past with a mythical home which doesn’t exist anymore or possibly never existed. She believes, however, in the potential of dreams. She wants to see the Past from the point of view of a single character, the person who once believed in the transforming power of the utopian ideal. K. Marx, F. Engels (1964) The Eighteenth Brumaire of Louis Napoleon. The Works, 8, p.151, Book and Knowledge. Anna Baumgart (b. 1966) lives and works in Warsaw, Poland. She is an artist, film director and set designer and has exhibited extensively worldwide; The Brooklyn Museum of Art, NKB and Kunstwerke in Berlin, Seam Museum in Israel, Casino in Luxemburg, the CCA in Moscow, Zacheta in Warsaw and the Centre of Contemporary Art, Warsaw. Her film Fresh Cherries, 2010, was presented at many international art and documentary film festivals such as Videobrasil, Sao Paulo, Videonale Bonn and The New Horizons. She was awarded first prize at LOOP festival, Barcelona in 2011.